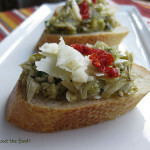 Artichoke and Green Olive Crostini - What about the food? Roasted Broccoli Soup with Bacon	What’s on the wine list? Still savoring my adventure in Olive Month! This appetizer was part of my Heart of the Mountain Menu. Lovely, flavorful crunchy bites and so quick and easy to make in 15 minutes or less! Slice baguette on the diagonal, 12 pieces about 1/2” thick. In food processor (I use my mini-processor for this recipe, just the right size!) 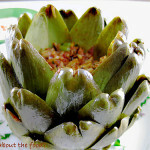 put artichoke hearts, pulse to rough chop. Add green olives, herbs and olive oil, pulse to combine. Add parmesan cheese and final couple of pulses. You want a chunky consistency, not a puree. Place baguette slices on cooking sheet (9” x 12”) Toast at 350 degrees about 5 minutes. Remove from oven and turn over, and toast other side about 3 minutes. 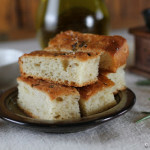 Don’t over cook, these are not croutons and you’ll want a little give to the bread. Spread your artichoke and olive mixture on your bread slices, sprinkle with chopped chives (optional) and serve. 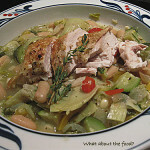 * Use about a tablespoon of dried italian seasoning as a substitute for your fresh herbs. 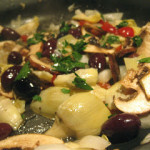 * Use pitted green olives, I used olives I had marinated in fennel, garlic, peppers and coriander for a flavor boost. 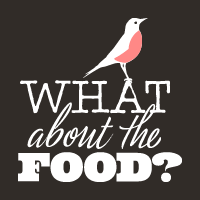 What’s cooking? August is National Olive Month.